Terrible news coming out of Alabama. 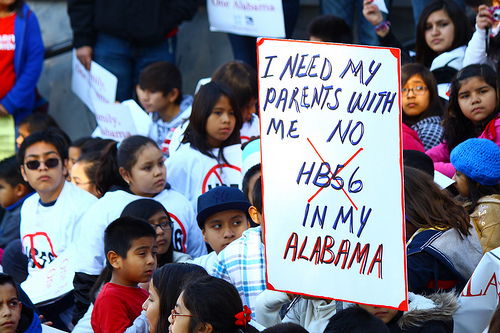 Governor Robert Bentley has signed that harshest anti-immigrant law of the country - yes even more so than Arizona's SB 1070. On Thursday Alabama Gov. Robert Bentley said he was sending the state legislature back to work on scaling back the harsh provisions in HB 658, an anti-immigration bill lawmakers passed the previous today. This afternoon, Bentley reversed his decision, and signed HB 658 into law. Bentley said he also disagreed with a provision that immigrant rights activists have coined the “scarlet letter provision,” which calls for the state to create an online publicly searchable database of every undocumented immigrant who appears in Alabama state court for any reason. HB 658 was intended to be an attempt to address the fallout of HB 56, the anti-immigrant law modeled after Arizona’ SB 1070, which allows police officers to question and detain anyone who they merely suspect may be undocumented. Yet the revision bill keeps unchanged many of the harshest provisions of the original. “The bottom line is there are too many positive aspects of House Bill 658 for it to go unsigned. I don’t want to lose the progress we have made,” Governor Bentley said.